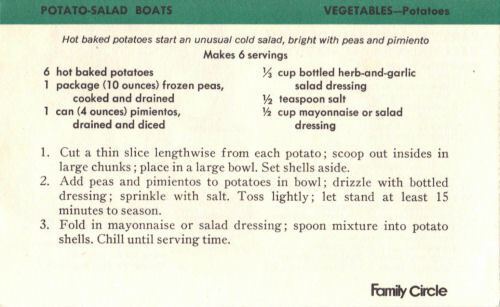 This promo recipe from Family Circle magazine was found in a large collection, date unknown. I’ve typed it out below along with a scanned copy. Cut a thin slice lengthwise from each potato; scoop out insides in large chunks; place in a large bowl. Set shells aside. Add peas and pimiento to potatoes in bowl; drizzle with bottled dressing; sprinkle with salt. Toss lightly; let stand at least 15 minutes to season. Fold in mayonnaise or salad dressing; spoon mixture into potato shells. Chill until serving time.